I love crafting and this Christmas project has been great fun. 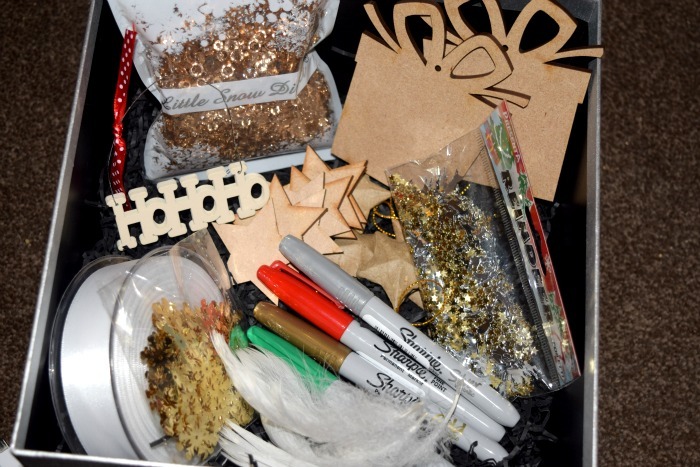 I was recently sent a present box full of craft goodies from Sharpie and for the past few weeks I have sat quietly crafting whenever I get a peaceful hour. 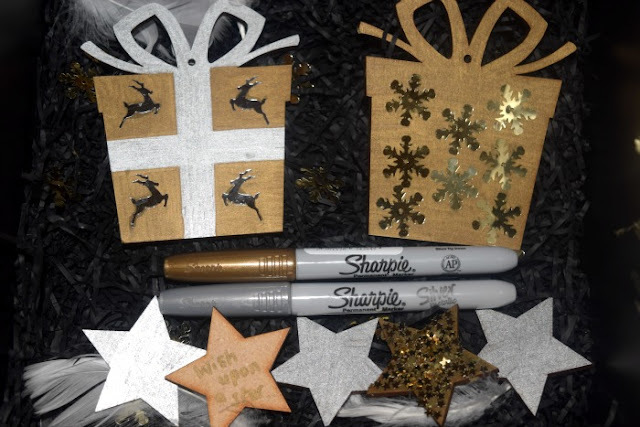 It is amazing what you can do with a couple of Sharpie pens, from creating home made decorations, up-cycling old tatty decorations or even personalising your own wrapping paper or gift tags. I love the metallic colour Sharpie pens. 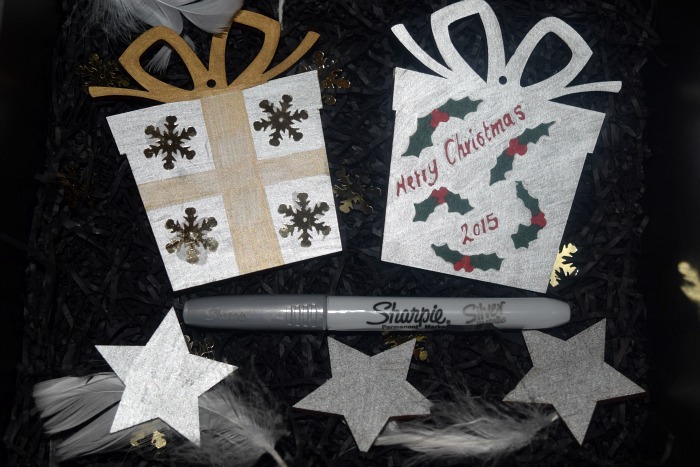 We have used them to write all our Christmas cards for a festive look and I have used it to make some beautiful star inspired decorations. These small wooden stars look great when coloured in with a gold Sharpie and covered in star shaped confetti glitter. They can be used to stick on to presents or what I did was pop a few inside a bauble along with some white feathers and some gold beads. 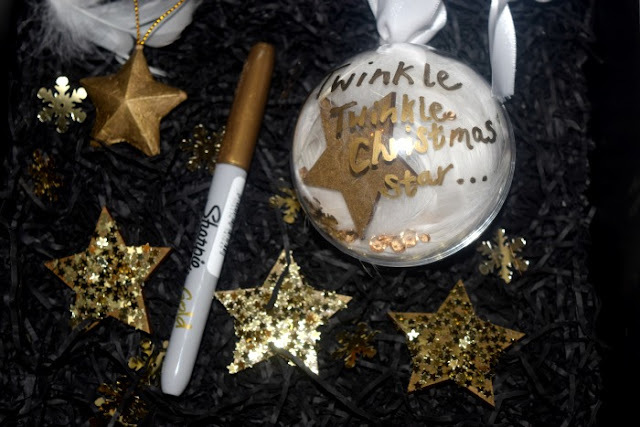 I then used the Sharpie to write 'Twinkle, Twinkle, Christmas Star...' which was one of the songs Zach sung in his first ever Christmas concert this year. I have made a few similar variations of this bauble but this is my favourite out of them all. Inside the box I found these two cute present shaped decorations and decided to play around with different ideas on each side. I love how shiny the silver looks and I especially love how the red and green stand out against the silver. The metallic pens are amazing. Considering how much I have used them, neither have yet ran out and the colour dries almost instantly on so many different surfaces. I can see myself using them for so many different things. My new home made decorations look great hanging on my tree and now I can start on wrapping all of the presents with a bit of personalisation on the way.